A fireplace bellow is both decorative and useful. Traditionally, the fireplace bellow was a necessity for woodburning fireplaces and since then, has become more of a piece of art. 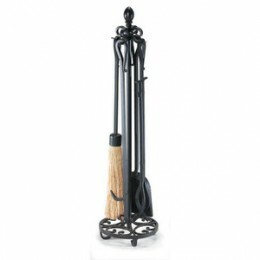 It can add a decorative touch to any fireplace and create a more rustic setting. Bellows draw in air through a hole in the bottom and force it out through a nozzle. This eliminates the need to blow directly into a fire, thus reducing the risks of burns. Bellows also add a lovely finishing touch to a fireplace without dominating a decorating scheme. 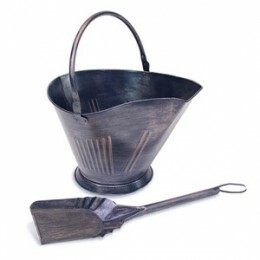 Bellows make an ideal housewarming gift for a home with a fireplace. Bellows draw in air through a hole in the bottom and force it out through a nozzle, which eliminates the need to blow directly into a fire, reducing risks. Bellows adds a lovely finishing touch to a fireplace without dominating a decorating scheme. Availability: Typically Ships Within 3-5 Business Days. Item is currently on back order until end of Jan/Feb 2012. Cast nozzle with rivet and leather details.